For me, “Genuflection” means more than just looking back and reflecting on something great from the past, but looking back and reflecting on something great from the past that still has the mystique it did so many years ago. These are cars that have stood the test of time. For most of these cars, I will drift back into what I like to call, “My Renaissance”. The time was late 1984, early 1985. I had just started high school and was going through a great renaissance. I had stopped being shy around girls and started talking and flirting. I stopped lugging a huge Bass to Orchestra class and traded it in for a Bass guitar in a band. I had broadened my mind from only classic rock to modern/new wave and jazz. Lastly, I had opened my mind to more than just Mustangs, Camaros, and Ferrari. All of a sudden I became interested in all things automotive. When I say Toyota Supra, most of you will have a vision in your head of a sleek, Mark IV, turbocharged rocket with a great big wing on the back. We might save the Mark IV Supra for a 30K check article later on…but for my intro to “Genuflection” I will dig back farther to spin a tale of Toyota’s Mark II Supra…we will journey back to Spring 1984. Our neighbor to the North (adjacent to our back yard) had a son who had just returned from an LDS Mission. We will call him “Super D”. Well, one of the first things Super D did after coming home was buy a brand new Black 1984 Toyota Supra. Up until this time, Japanese sports cars to me consisted of not much more than Datsun’s Z cars. But yet here was this menacing black dragon. It had a sunroof, Trick looking aluminum wheels, and a slick rear roof spoiler that made the car look fast as it rested under the cool shade of a tree on the side of his parent’s house. I heard the car come and go many times that spring, and the deep throaty straight six cylinder engine had a snarl that I became quite fond of. My favorite was when he would pull the car on to the lawn, turn up the stereo, vacuum the interior, and then wash the outside. All while rockin’ the latest Lionel Richie cassette. 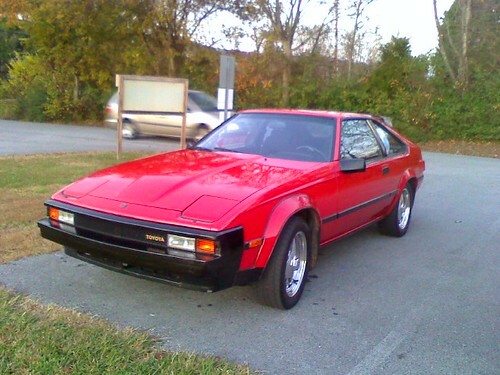 The Mark II Supra signaled the first time the car would go from a sporty model of the Celica, to a real sports car, and the last time that it would share the Celica name and platform. Each version of the Supra notched up a level of lunacy. This is an epic car that even today is in high demand and if you are able to find one, just as with every clean, unmolested Supra model, get out your checkbook.